Do you need to know if someone has received your email? If you do then using email read receipts would seem like the obvious solution, and in some respects they are. However they aren’t foolproof. Here we look at what they are and how they work. 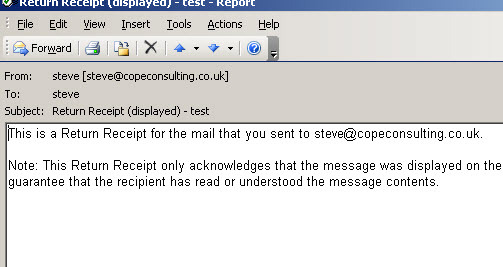 Email read receipts are a feature of the messaging system, and need to be requested by the message sender, and confirmed by the message recipient. They are used to verify if an important message has been read. If you do not receive a read receipt then you need to contact the recipient using another method. Whether or not a read receipt is returned or not is completely at the recipient’s control, the sender has no ability to force a read receipt. It also important to bear in mind that not all email clients are capable of generating read receipts, and they are usually not available for web based email clients like Gmail, Hotmail (outloook.com) and Yahoo email. Email clients like outlook have three main settings as shown in the screen shot below. When set to always send then a read receipt will be sent, and you will not know it happened. Ask before sending is the preferred option. If set to ask before sending then when you receive an email message containing a read receipt you will see a message like the one below when you go to open the message. If you respond to an email receipt request then the sender will see a message similar to that shown below. 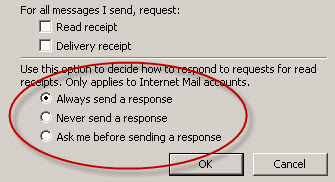 Note: Even though Gmail,Yahoo Mail and Hotmail don’t support read receipts in their Web Browser client, if you use a desktop client like outlook express with your account then you can request, and respond to read receipts. Some people find read receipts rude and so it is important that you use them sparingly. Personally I prefer not to use them, but instead I request an email confirmation if it is important that the recipient has read the email.